Sometimes it pays to look the other way! This small painting was done as a distraction from another en plein air painting underway at the same time. I ventured down to the Walloomsac River on a late October morning. The goal was to get a painting of the quietly flowing river during a quiet time of the year. The resulting painting was “Walloomsac, October Morning“. The air was both cool and moist that morning and the sky cloudy. Nice conditions for “atmosphere” in the painting, but very bad for drying wet washes. Since trouble often results from working back into slowly drying washes, it is my habit to start a “distraction” sketch or painting. Since my main subject was generally looking north and west, I turned and looked toward the south and east, where the Walloomsac River bends away again and disappears into the woods. What little sun there was filtered through the remains of the season still clinging to the drooping branches. 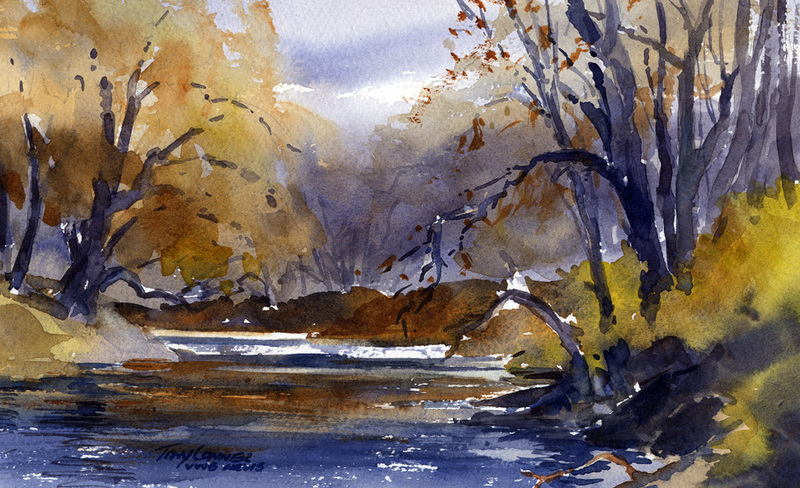 A little shimmer appeared on the surface of the river, providing contrast with the low key color in the scene.